Transitioning to becoming a single parent is not easy. We have with us Dr. Robbin Rockett share with us her story and the identity shift she experienced. Robbin’s parents, originally from San Antonio, saved up to buy a farm in the country where Robbin grew up. Money was not really part of her life until she turned 11, and her parents divorced. Her mother got the house, and her father got the land around the house. She then saw the impact of the stress of divorce, and how difficult it was for her mom, raising two children, in the middle of nowhere. At that time, they struggled with money. Although she had a college degree, finding work as a PE Teacher in such a remote area was extremely difficult. So she took odd jobs, and Robin keenly remembers frozen pipes in the winter, not having water, or not being able to pay the bills, and stress around gas costs. There was always a lot of stress and worry about money. Despite this, Robbin saw her mom go the extra mile, working hard, and excelling at whatever job she did, which included driving a cement truck, to working in a convenience store, to eventually going back to school and becoming a science teacher. When Robbin went to college, she was very tainted by the worry of money, and so was very cautious with her money. However, the strong independence and hard work mentality she learned from her mother, led her to support herself through college without any student loans. While attending college full time, she worked 20-30 hours per week. This enabled Robbin to live off campus and pay for her car, food, and rent. Identifying herself as a helper of others, Robbin’s career of choice, ever since she was a young girl, was to be a clinical psychologist. When Robbin herself became a single mom, after an unexpected divorce, she realized that it would be hard, and stressful and that she would need help, especially given her ex-husband had moved far away from her and the children. Her children were aged 6, 4 and 1 at the time, and she hadn’t worked for a year since the birth of her third child. Robbin needed to figure out how she was going to get back to work to support her family. To assist her, she joined a support group and had some individual therapy as well. Being a single parent is a shift in identity so the individual therapy helped her dig deep to identify where she fit in, and how she wanted to make her career work and allow her to still be able to pay the bills while she raised her kids. As a psychologist, she initially felt like she had an upper hand in dealing with her situation, however, she soon realized that when you are in it, going through the challenges, and dealing with the overwhelm, it takes a lot of time to learn how to cope, and her education did not always help her in the moment. She had to learn to be more compassionate in herself and give herself time to adjust. Instead of reopening her business right away with young children at home, she opted instead to go back to school to study to be a Special Ed Teacher. Given she had many teachers in her family, she felt it would be a good fit – a day job that she could do after 1 ½ years of study. However, a year after the divorce, she was feeling stronger, and better. She decided then to switch her focus back to a private practice despite the money she had invested in her education. Robbin dove into her community and became president of her chapter. Her leap of faith paid off, and her career gave her the work-life balance that she really needed. Robbin now knows to follow her passion, and the money stuff will come. Robbin did all the budgeting, but her husband took care of the big things such as getting loans, interest rates, etc. She felt somewhat cheated when she became single as she had to work hard to understand all of the ins and outs of finances. Robbin wished she had known about financial planners. Her best advice to someone in the same situation as she was is to reach out to a financial planner – they are not only for people with lots of money. They can help you go through the financial difficulties associated with your situation, and how to work out handling the money you have, and what to do for future considerations. Click here for my interview on the Solo Parent Life Podcast! 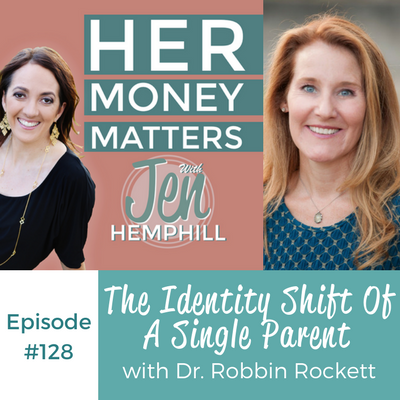 The post, HMM 128: The Identity Shift Of A Single Parent With Dr. Robbin Rockett appeared first on the Her Money Matters Podcast.